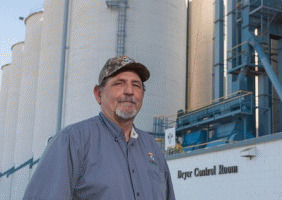 In 1982, two prominent Colusa County farm families embarked on a joint venture to construct a modest 400,000 cwt rice drying and storage complex located one mile north of the small community of Arbuckle, California. In order to keep pace with market demand, the facility went through a series of expansions between 1985 and 1996. In 1996, the rice mill was added adjacent to the property. Today the facility boasts a storage capacity of 2,000,000 cwt for two separate varieties of medium grain rice. Four Shanzer column dryers produce a combined drying throughput of 6,400 cwt/hour. The four receiving pits, coupled with two truck scales, allow an offload capacity of 20 truckloads per hour. Providing California Family Foods with the tools for a quick turnaround time during Harvest. Since 2001, California Family Foods has leased the Zumwalt drying and storage facility located in nearby Colusa, California. This added 495,921 cwt to our storage capacity while providing convenient access for growers on the East side of Colusa County. Four receiving pits and two truck scales with an offload capacity of 20 truckloads per hour, help to reduces the backlog created during peak harvest conditions.